Chapter membership applies those tools to your organization and community. Together you are a Power Member! 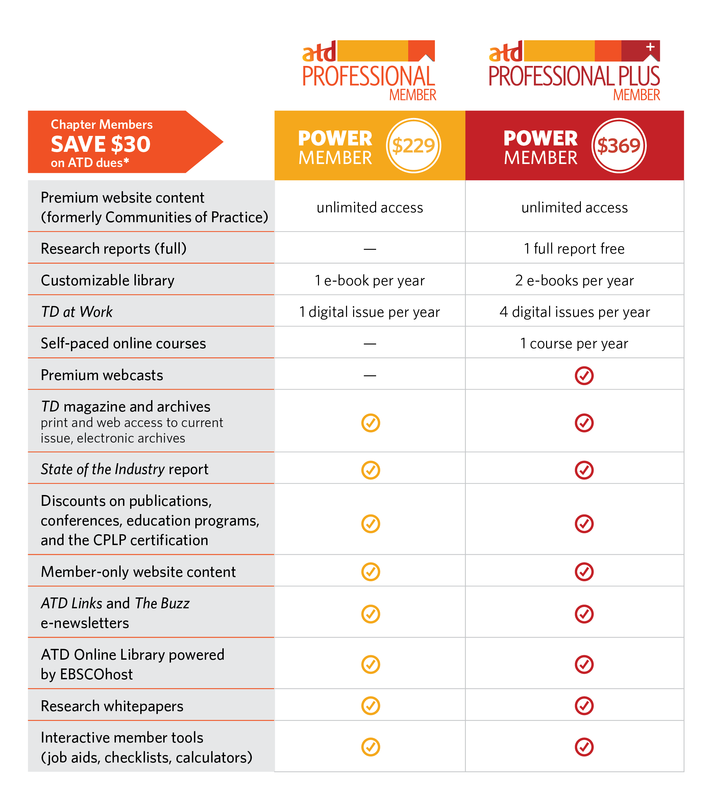 Current members of ATD chapters may join ATD for a special annual Power Member rate by using your chapter’s Chapter Incentive Program (ChIP) code, CH8091. Chapter members joining ATD will save $30 on membership, and receive Professional membership for $229 and Professional Plus membership for $369. Visit www.td.org/membership and select your preferred membership level. To receive special pricing on your ATD Membership dues, make sure to select your chapter’s ChIP code [CH8091] at checkout. If you are currently an ATD Chapter Member and not an ATD Member: Chapter members can get the discount online by using the Chapter ChIP code CH8091. Those wishing to join via phone at the Power Member rate may call ATD Customer Care at 1.800.628.2783 (Monday-Friday, 8am-6pm ET). To receive the discount, you must mention the Chapter ChIP code CH8091. If you are currently an ATD Member and not an ATD Chapter Member: Join the chapter at the discounted rate of $85 (choose New Member with Current ATD Membership). This will make you a Power Member. If you are currently not a member of either: Follow the instructions above in both sections to join the Chapter and ATD! If you have any questions, need help joining, or are still undecided, contact us: ocoffice@atdoc.org or 714-527-4785.